As my regular readers will know (I have some of those now 😀 ) Mrs Scot was in a car accident on Thursday evening 🙁 – The car is badly damaged – both airbags went off, bumper / bonnet ruined, possible cracked radiator… – and is currently at the insurer’s garage being assessed. Given that the car is only worth around £2500 ($4000), I am fairly confident that it will be written-off. Being the frugal Scot that I am, I opted not to take any of the ‘extras’ on our policy (courtesy car, breakdown cover etc.) so we are currently minus a car. That must be a the shortest ever time for owning two cars! Then again it’s a blessing that we bought the second, as we would be really stuck without one at all! After finally sitting my bike test in summer 2011, I made the most expensive purchase of my life – a Yamaha R1 (More about this bike at the end of the post). Of course being the Savvy Scot that I am, I didn’t buy this brand new; but I still spent almost £8000 ($13,000) on the bike, insurance, helmets and protective clothing. For those of you who think this is excessive or a bit ridiculous – I respect your opinions, however I believe you should save on the things in life that seem generic to you, but invest more and spend money on those that make you tick! For me, this includes travel, diving and ANYTHING adrenaline related :). Back to the story…. Shortly before writing this blog (and just before Mrs Scot became Mrs Scot [our wedding]). I had an accident on my motorbike 🙁 !! It happened near my house; I was leaning into a corner (15mph) and a car was in the middle of the road – I tapped my brakes and the bike went out from underneath me – The ground was very cold and in hindsight a little slippy. It wasn’t too serious, but enough to do some seriously expensive damage to my bike – if you know anything about motorbikes, you will know how expensive faring pieces are! I had mushrooms installed – drop protectors – which got sheared off, along with the gear pedal and some extensive scraping to the bodywork. The bike was put under a cover for winter and the repairs put on the back-burner – we had a wedding to pay for. I was outraged!! Therefore, a few weeks back I ordered the part myself (£25 or $40), with the intent of going into a repair shop with the part in hand, hence reducing their ‘sourcing commission’. The part arrived and I put it in the cupboard, safe in the comfort of knowing it was there for when the time came to repair. That time suddenly became Friday, when the realisation hit that I would have to start getting the train again come Monday if Mrs Scot needed to use the other car!! (NOOOOO) I sat down and put my mechanical engineering degree into practice and had the new part installed within 15 minutes – easy!! 🙂 Big saving of £175 ($280)!! 😀 I must admit this also gave me a sense of achievement, the same feeling you used to get when you built a lego model or completed a puzzle as a kid! Today’s Question – Have you ridden/been a pillion on a motorbike, and do you like it? I spent the summer in Thailand when I was 16. Got around on a motorcycle. At the time, I was fearless. Looking back, I was an idiot. Wearing a helmet on a motorcycle is the difference between an open and closed casket. Awesome summer though. And now I know that I won’t let my daughter within a mile of one of those death machines. No offence though, glad you enjoy it. Joe recently posted..Common Cents #2 – TFSAs or RRSPs? I used to ride on the back with my boyfriend. It was always a giggle. No, I’ve never been on a motorbike… soon, though, I hope :). I need to make more dangerous friends, I think. 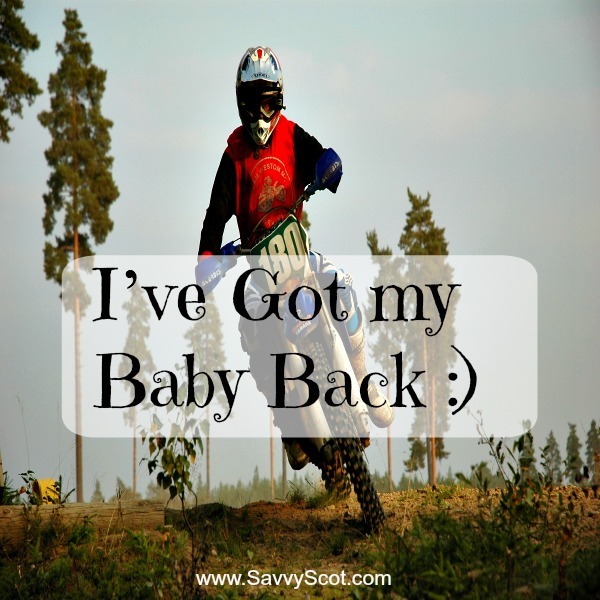 Riding on the back of a motorbike or moped is one of my favourite things to do when I am travelling with my partner. He drives, and I sit back, enjoy the view and stretch my fingertips out into the winds of adventure. I love it! Hannah, Thanks for taking the time to comment on some of my recent posts 🙂 – I know what you mean about the moped abroad thing – this has become a tradition with me and Mrs Scot too 🙂 – nothing better to escape the intense heat of the sun than the breeze of a moped! A really cheap way to travel and see the destination too! Riding a motorcycle does seem like a blast. I had a college friend who died riding one though. So I probably wouldn’t ever buy one myself. I can relate about investing in something you truly enjoy. It sure beats wasting money daily on some luxuries that aren’t even important to you. When I first started reading, I thought your baby was gonna be your wife. I was wrong! I can’t be trusted on a motorbike, though I have ridden a few. I see you changed your theme! I have ridden pillion once on the back of an r1 with a guy that rode with an extremely sporty riding style.